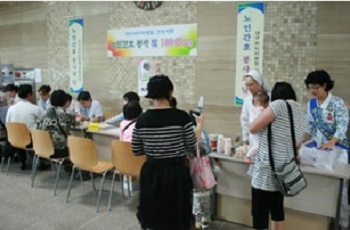 Daegu Fatima Hospital ran three free medical services during the month of October as a means to build fraternal solidarity for the weak and the poor. On Oct. 2, the Nursing Department of DFH hosted a free medical service for the elderly citizens in the main hall of the Hospital. Those with problems were given extra exams and after a warm hearty treatment, they all received snacks and soft drinks. 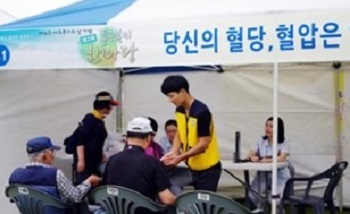 On Oct. 23, the rural people and multicultural families were given free medical benefits from orthopedics, ophthalmologists, pharmacists, nurses, nursing assistants, social workers of Daegu Fatima hospital in Wacheong GangHakli Village in Gyeongsan Province. 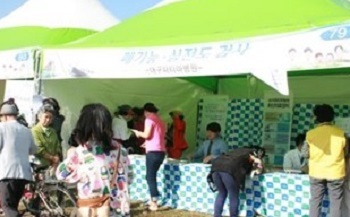 From Oct. 10 to 13, Deagu Fatima Hospital participated in the 7th East Daegu Lifelong Learning Festival hosted by the Health Ministry Department of Daegu metropolitan City, providing ECG knowledge, pulmonary function tests, and health-related information.